VSI is dedicated to maximizing opportunities for people with disabilities by finding the right job fit for each individual. 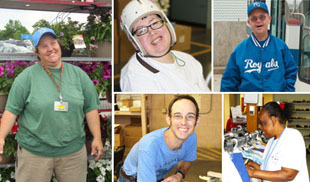 Vocational Services Inc. is a leader in programs for people with disabilities. We stress the rehabilitative powers of positive employment as well as innovative programs to ensure that everyone has an opportunity to succeed. For over 50 years, we have delivered programs that are nationally accredited and state certified. Equally important, these programs are individually tailored to help individuals succeed. • Work and Personal Services provides a unique services for over two dozen individuals who otherwise might not qualify for employment. Read More. • Facility Based Extended Employment at three workshops, including two in Liberty and a third in North Kansas City. Read More. • Competitive Integrated Employment places people with disabilities in competitive jobs within the communities of Clay and Platte counties. Read More. • School to Work serves high school students with developmental disabilities and helps them find meaningful jobs in the community. Read More. • VSI Show-Me Animal Products creates additional employment opportunities for people with disabilities while creating outstanding first aid kits and other products for pets and horses. Read More. • Program Servces Case Management may be one of the less vsible programs at VSI but it's also one of the most important because of its caring and detailed work with people with disabilities, parents and guardians. Read More.